It’s now easier than ever to create your own poker games & play with your friends using webcams on the NEW updated Delaware Park Poker software. In a few easy steps, you can create your own private poker tournaments and cash games. You decide the time, name, number of seats, stakes, buy-in and more. 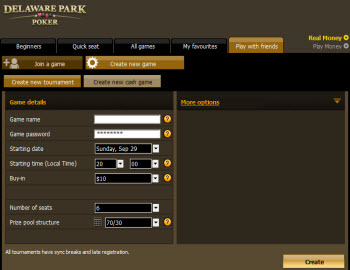 All you need to do is Download the upgraded version of Delaware Park Poker & start creating! How can I create a Delaware Park Poker Play with friends? 2. Click ‘Create New Game’ and choose either ‘Tournament’ or ‘Cash Game’. 3. Fill in your desired ‘Game name’, ‘Game password’, ‘Starting time’, etc. That’s it! 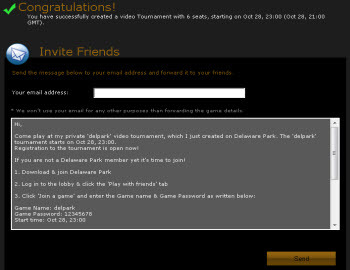 You’ve created your Delaware Park Poker Play with friends, which will appear in the lobby. How can I invite friends to my Delaware Park Poker Play with friends? Once your private Delaware Park Poker Play with friends is created, you can invite your friends to play. 4. Share: Copy and paste a link wherever you like! Paste it on Facebook, Twitter, Skype, chats, forums or even in emails and invite your friends to play! How can I join a Delaware Park Poker Play with friends? 3. Click ‘Join a game’ and enter the game name & game password*. * These details are in your email invitation or social network invitation page.